PRESTONSBURG, Ky. – AEP Kentucky Coal is wrapping up the last few pages in the final chapter of a story that actually provides a new beginning. Located near Prestonsburg in eastern Kentucky, mining at AEP Kentucky Coal began prior to the 1980s under previous owners. AEP purchased the mining operation in October 2001 from Quaker Coal in a bankruptcy settlement. At the time of AEP’s acquisition, the mining operation included six underground mines and three surface mines. Bowling Fork area after reclamation activities completed, photo dated July 2012. In April 2004, AEP sold its active mining operations to Wexford Capital LLC, while retaining reclamation liabilities. In the years that followed, AEP worked toward the reclamation of about 9,000 acres of former AEP Kentucky Coal mining lands. Now, reclamation activities have been completed and AEP is working on the final disposition of about 2,800 acres of property owned by AEP Kentucky Coal. All told, there have been a total of 47 mining permits and a total of $30.6 million in reclamation bonds that have been 100 percent released. Over the years, a small number of AEP Kentucky Coal employees have acted as stewards of efforts to ensure that the property is reclaimed in such a way that is useful, beneficial and aesthetically pleasing. The reclamation team consisted of Nelson Kidder, director – Reclamation and Coal Development in Fuel, Emissions & Logistics; Vickie Stone, coordinator III; Rex Craft, manager – Mine Engineering; Kelly Flanagan, asset coordinator; Randall Risner and Richard Childress, general reclamation supervisors. These six current and former employees have worked to bid contracts, manage the contracts, oversee the work of onsite contractors, and to work with government regulators to ensure regulatory compliance. Reclamation is monitored in three distinct phases. 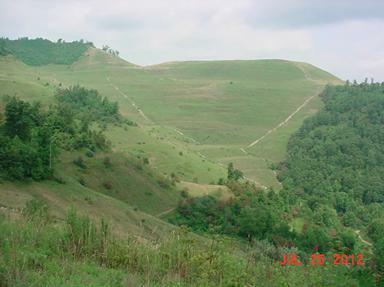 First, the land is returned to its original contours and vegetation is planted to prevent erosion. After two years, if the vegetation has been established, the project can move to the next phase. This involves tree planting if required by the permit. Three years later, the project can move into its final phase if site plan requirements are maintained. State and federal reclamation laws require posting surety bonds of thousands of dollars per acre. When all phases of reclamation requirements are complete, the bonds can be released and most of the leased acreage reverts back to private ownership. Since reclamation efforts began, what were once mining lands have become pasturelands, wildlife habitat and forested lands. Those efforts have not gone unnoticed. Regulatory agencies and commissions have commended AEP Kentucky Coal’s work. 2002 – Commissioners Award for reclamation excellence from the Commonwealth of Kentucky Natural Resources and Environmental Protection Cabinet.